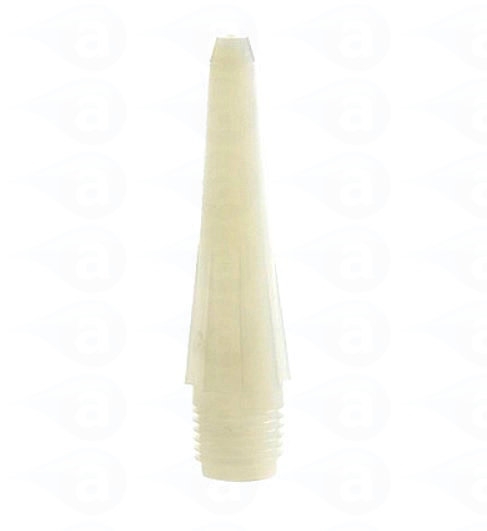 Offering the widest range of dispensing nozzles for use with cartridges and valves. All nozzles are industrial grade safe for use to 100 psi air pressures and are certified silicone-free. Threaded secure attachment for leak free dispensing. 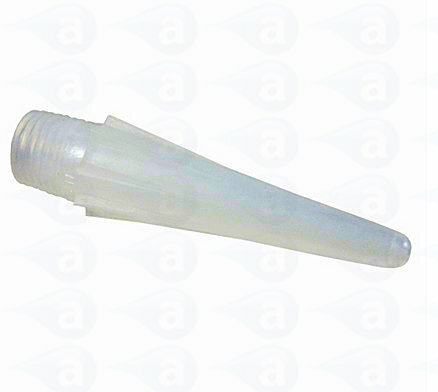 Precision moulded 2.5 Inch long standard nozzle x 1/16 Inch (1.59mm) orifice. 1/4 Inch NPT thread to fit all cartridges and TS941 spool valves. Nozzle can be cut down if required. If using with pre-filled sealant and silicone cartridge cartridge tubes that feature an external nozzle thread, use part number TSD931-296 adapter fitting. This will provide a leak free connection to the range of nozzles. Natural high density polyethylene material (HDPE). Supplied in sealed packs of 10, packs of 50 or bulk packs of 500 or 1000. Ship from our UK warehouse direct from stock - no delays. We also stock manual and applicator guns for use with cartrdges and nozzles. Typical Applications:- Nozzles are moulded in high or low density plastics and have much thicker walls than a standard silicone caulking types. The internal bore has a taper and this ensures the material moves consistently down without restriction. All nozzles use a 1/4 Inch NPT external thread for leak free cartridge or valve attachment. Select product ... TS216 Nozzle 2.5" x 1/16" TS218 Nozzle 2.5" x 1/8" TS416 Nozzle 4.0" x 1/16" TS418 Nozzle 4.0" x 1/8" TS432 Nozzle 4.0" x 1/32" TS616 Nozzle 6.0" x 1/16" TS618 Nozzle 6.0" x 1/8" TS1050 Ribbon Nozzle 0.5" TS1075 Ribbon Nozzle 0.75" TS1100 Ribbon Nozzle 1.00" TS1175 Ribbon Nozzle 1.75"